If you are a health freak and are looking to make a toned abs to flaunt, bicycle crunch is the exercise you should be looking to incorporate in your exercise regime. Many people brag about having a six pack ab. But if you want to rule over them by having a smashing and irresistible eight pack abs, bicycle crunch can help you a lot on that. It is not that hard to do. This is one of those exercises that give a mountain of benefits without requiring much of an investment. You do not need to have any equipment to perform this. All you need is lie on your back on an exercise mattress and support your neck with your fingers by placing your hands behind your head. Then, tuck in your abs and lift your shoulder blades of the ground and also bring your knees closer to the chest. Now, try to touch the right knee with your left elbow by rotating your body and by keeping the left leg stretched straight in front without touching the ground. Do the same for the other side to complete the cycle. Make sure to keep normal breathing while doing the exercise. Also focus on tightening the abs and not the neck while performing it. Stop immediately if you feel any pain in the lower back. To get effective results quickly perform this paddling exercise with 12 repetitions in 3 sets at least 3 times a week. After enlightening you about the procedures, let us aware you about 10 specific advantages of doing the bicycle crunch exercise. It is one of the biggest advantages of doing this exercise. The pair of muscles in consideration is the rectus abdominus or upper abs muscles. Bicycle crunch helps to build and tone those exclusive and elusive pair of abs muscles that aids in completing the dashing eight pack ab. These are the core muscles that are mainly worked on by the exercise. Keeping your legs flat while doing the exercise especially works in favor of shaping up the middle pair of abs muscles. The essentiality of keeping your feet off the ground all the time while performing the exercise works in line with shaping up the lower abs muscles. Apart from providing strength to the muscles it also tones them up to give them a visually excellent appearance. These are basically the big muscles that are present at the front of your thighs. While keeping the thighs afloat they are highly worked and are thus worked up well build in strength and shape up as well. Similar to quadriceps, these are also muscles or rather tendons of the thigh that connect the back of the thigh big muscles to the bone. These muscles are worked up when the paddling pattern is practiced while doing the exercise. This exercise acts to stretch and tone up these muscles. These are one of the accessory muscles that are worked up in addition to the core intended muscles. Performing this exercise firms the hip muscles and also aids in shading extra fat from the area. In addition to that it also helps to shape up your hips for good. Chest muscles are also built and toned up in this exercise. While doing the pushes, the chest muscles are on the high work list and can well be witnessed by observing the staggering effects after exercising the bicycle crunch exercise on scheduled and dedicated basis. The lats are also worked up in this exercise. It helps to strengthen the muscles. By doing this exercise properly it helps you to develop a nice V-shaped upper body which I am sure most of us desire of. The shoulder muscles are also among the accessory muscles that are worked up. While supporting the neck region and touching elbow to the knees, the shoulder muscles are highly involved. This practice aids in developing well built shoulder muscles for all others to see. 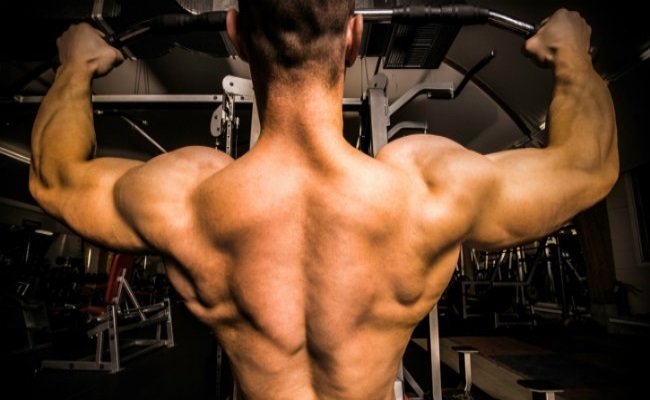 Back muscles are also worked upon in this exercise. While performing the paddle motion back muscles are also highly employed which in turn are exhibited by their well toned nature afterwards. As can be witnessed above, this exercise acts well as entire upper body building and toning exercise without being just an exercising tool for shaping up the abs. So, what are you waiting for? Put your track suits on and work hard with this exercise and surprise your loved one with the better version of you the next time you meet after a while.